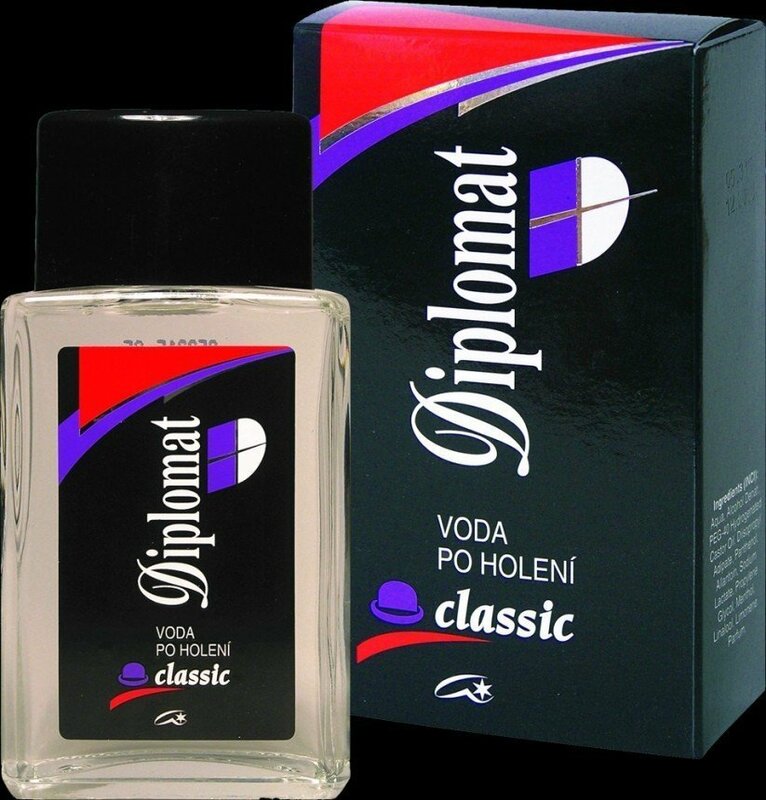 Diplomat Classic (Voda po holení) is a perfume by Astrid for men. The release year is unknown. The scent is woody-fresh. It is being marketed by Sarantis. This is a variant of the perfume Diplomat Classic (Toaletní voda) by Astrid, which differs in concentration. In the first half of the 90's I stayed quite often in Prague, among other things also once for several weeks in the context of my education. At that time I wasn't overly interested in fragrances, but I was already interested in creating new environments with everyday products, so it was natural for me not to bring aftershave but to buy it locally. Of course, I wasn't looking for the international brands I knew from home, but was looking for something specific Czech. So I came across a white, still rather "ostig" looking bottle with a milky after shave lotion called "Diplomat" (since all Czech words are emphasized on the first syllable, pronounce them out loud on a flashy-short "DIPP" at the beginning, just as my grandmother used to stir "ZITT-ronat" into the stollen), which had somehow done it to me. Not that I felt like I was in the fragrance paradise I even strangled a bit with the somewhat unfamiliar fragrance, but somehow I liked it. And apparently in such a way that I had never completely forgotten him in the following 25 years or so and was happy like a snow king when I found him again recently - on the spot in the Czech Republic (how, I described that in my blog "Aus Böhmens Hain und Flur"). Diplomat (today Diplomat Classic, because even this provincial brand on a global scale has not been ignored by Flankerei) is a thoroughly honest, very straight scent. Simple, simple, clear, spotlessly clean, very manly. The middle of the fragrance is very dry wood, which is made more lively by a set of strong spices (but not Christmassy and even less green-fresh herbs). A proper scoop of citrus notes prevents the drought from tipping over into the dusty or stinging end. The bottle, which has a splash device, is no longer the square one with the wide black cap shown here on Parfumo. It now looks rounder, prettier and more contemporary, just like the eponymous EdT (voda po holeni = aftershave, toaletni voda = toilet water), which on Parfumo is still in existence without commentary, statement or evaluation, but with a current product illustration. Maybe I'll put a photo of the aftershave here today. The aftershave rightly bears its name. The durability is minimal (with a good projection) (to enjoy the scent longer you should use the EdT, but there was only one tester left in the drugstore where I was hunting), and the liquid is very viscous, almost like a lotion. The product does not have a strong alcoholic effect (and is therefore neither drying nor flashily burning), but is enriched with classic skin care substances such as panthenol, allantoin and hydrogenated castor oil both in terms of skin feel and ingredients and is therefore very gentle and smooth to the skin. So if you are looking for a thoroughly honest, masculine-dry (but not dusty), already something especially fragrant, skin caring aftershave, a visit to a Czech drugstore might be well worth your while. So, for today I stop, and if the heat does not kill me before, then I comment sometime also the Flanker "Diplomat Fresh" and will report on this occasion also still something to the company history of the manufacturer "Astrid". 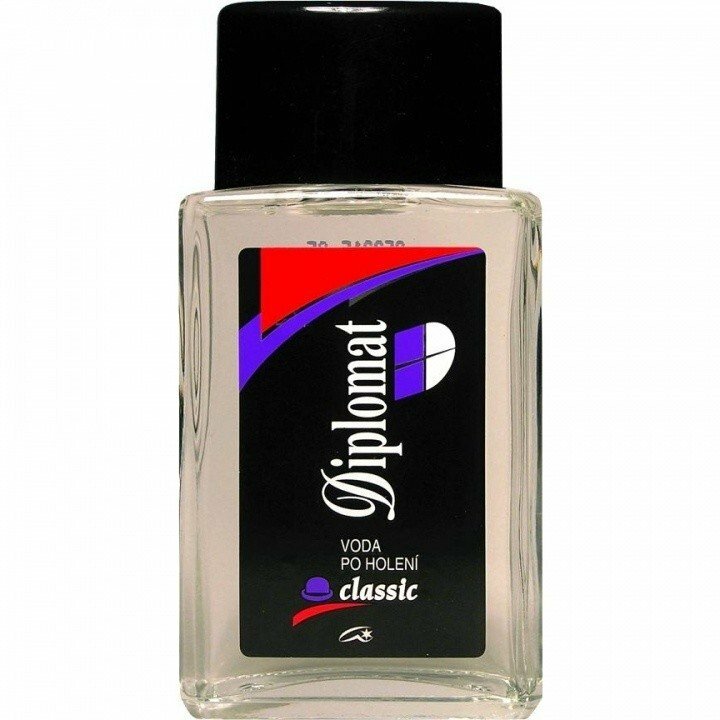 Write the first Review for Diplomat Classic (Voda po holení)!